Can't thank you enough, ThirtyONe, for the informative post. You've answered a good number of my questions about the bike, even as it pertains to travel down south. Probably very good advice, looking toward a ktm or something similar. It may be misguided, but I've always felt some security in the reliability of the big 4 manufacturers, particularly Hondas. I should look more deeply into the reliability of modern Ktms. I envy you your upcoming adventures, as well as your familiarity with the people/culture of CA and SA. I've had but a few visits south, and while the dangers of travel are well represented in the media, I am most struck by how kind and gracious the people are. I'm pleasantly surprised by this bike so far, but do have a couple of gripes. I'll search on here to find solutions before blurting them out, but I wonder if I might consult you from time to time? It seems we have similar travel aspirations and as far as bike stuff, I'd love to skip the trial and error where i can. Who knows, maybe we'll bump into each other on some Guatemalan trail one day. I completely understand your perspective though. Like I had mentioned, the CB500X is a great platform for a grand tourer if you put some money into the suspension and ergos. The engine and chassis are pretty robust and the little 471cc engine gets great gas mileage. Much to think about. Good to know that Honda AND KTM are well supported where I'm aiming to visit. I'm seeing the 790 adventure model's msrp closer to $14k, and I imagine they hold value a bit better than these Cbs. I'm curious about what you shared re: luggage. Did you suffer some inconvenience with the soft stuff, or was it just a matter of excess worry? I've considered each and lean toward hard luggage, as we carry very necessary equipment with us... losing it could be catastrophic. Also, the fat bars. Do you endorse them solely for their crash worthiness, or other reasons? It's something I'd not even considered, but I am somewhat naive when it comes to real dirt riding..I come from a roadracing background. I'm curious to see the depreciation on the 790. I didn't realize they were going for 14k new. That's not a cheap bike for sure. A fatbar will be more robust in a drop. Much less likely to bend from personal experience and from what I've read on a number of forums (dirtibke and dual sport included). As for luggage, yes, people steal things down here. It's much more common. I didn't feel comfortable leaving my bike unattended if I went into a restaurant and the bike was out of view. I was a solo traveler, so it made matters worse. Additionally, people can slash bags open, and not only do you lose your contents, but your bag is essentially useless afterwards. Most restaurants, all hotels and hostels and nicer stores will have armed guards in the parking lots. (In Central America, I can't say for South). Those guys may or may not look after your bike. All of these places have designated parking for bikes. You cannot occupy a regular parking spot with your bike. So sometimes the bike parking is waaaaaay at the end of the lot, in some dark shady corner, and sometimes out of direct sight of the security guys. If you want to ride up to a central park in a town, park and walk around, there's a greater possibility of some kids or thieves messing around with your bike. They will definitely come over to it. Many will sit on it while you're not there and guaranteed you'll find people just running their hands over it. There's not that natural respect for "hands off" in Latin America. They will lean on your bike, sit on it, and flip switches and turn knobs or whatever. It's just the way things are here. I would rather not have a dozen hands running over my bike simultaneously. It provides cover for one of them to start poking around. Like I said, I'm open for a soft luggage solution for panniers if they're lockable. They're lighter and less likely to trap/break a leg if you fall over in the dirt. It's why I'd go with a hybrid combo if I could. Hard luggage it is. I don't wanna tempt fate in that category. I chuckled a little to read of folks sitting on or otherwise molesting a stranger's ride. That sort of thing would make me crazy here in the US, but now I'm prepared for it. All part of the experience, I suppose. Do you know of an equally beefy bashplate, engine protector to the Rally Raid product? Liz at RR tells me they only have one for 2017 models. Thanks bud. You've been very welcoming. Oooh! nuther question Thirty: What riding gear do you wear down there? Should I be pm'ing you, rather than polluting the 'Introduction' sub-forum? I try to go ATGAAT, (all the gear all the time). Honduras is hotter than in Guatemala, as we don't have the highlands. But, we do have cooler times of the year and warmer times. Currently wearing a mesh jacket, for most riding but will layer up when I head north into the mountains. I'm also acclimated to the heat, so I get cold easily now. I've found that layering is really the best way to go for any kind of moto touring. Lots of thin layers. I'm like you...even our timid California winters are too damn cold for me now. Too skinny maybe, and now getting pretty old. I've pulled the plug on the Stage 2 Rally Raid business.. Held off on the big bars, for better or worse. I have f#cked up wrists, and the stock bars are not too offensive to them. Will look into the fatties at a later date. What hard saddlebags are you considering, Thirty? I like to pack light and so haven't a need for a wide load. I'd like to find some aluminum, or otherwise tough jobs that are narrowish on the bike. I can get to googling, but I thought I'd consult you first. If we ever meet down your neck, lunch is on me bud. Congrats on the Rally Raid kit! It's quite a purchase, but it really transforms the bike. 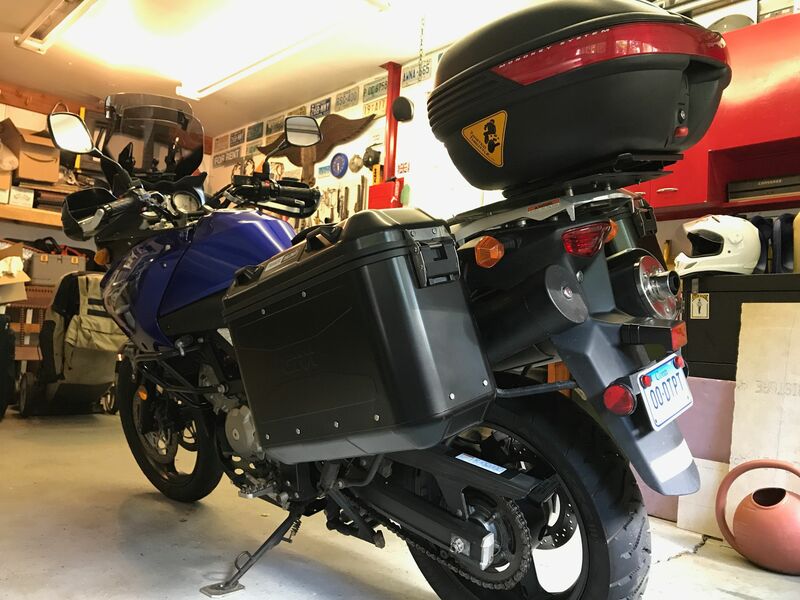 I bought the Givi Trekker Dolomiti bags last year and mounted them to my VStrom last summer. I put a few hundred miles on the bike with the panniers and found them pretty nice. I have the Givi Trekker 33L box (the old style ones) and the Dolomitis are muuuuch lighter than the 33L Trekker. I do like the Dolomitis quite a bit, they're cheaper than their flagship models, the Outback version and they're pretty light. If I were to buy again, I might look at the Happy Trails or Tusk panniers. These two don't have rivets on the outside. The HT and Tusk look a little more robust (welded instead of rivets) The 7.5" bags also are a little narrower. They make 9" wide versions as well if you need more space. One thing to note also, is that the HT panniers open to the side, where the Givi Dolomitis that I have open towards the back. 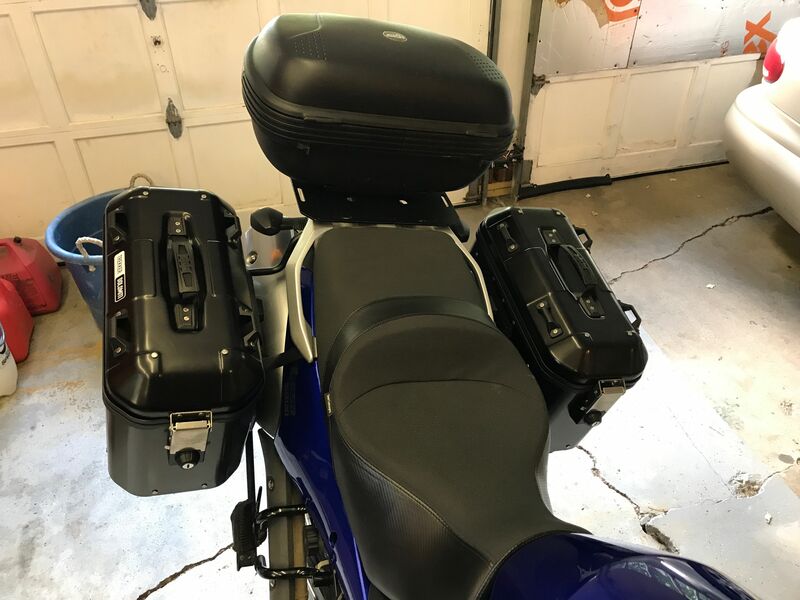 I am now using a 46L Givi plastic top box and it's more short and wide vs tall. 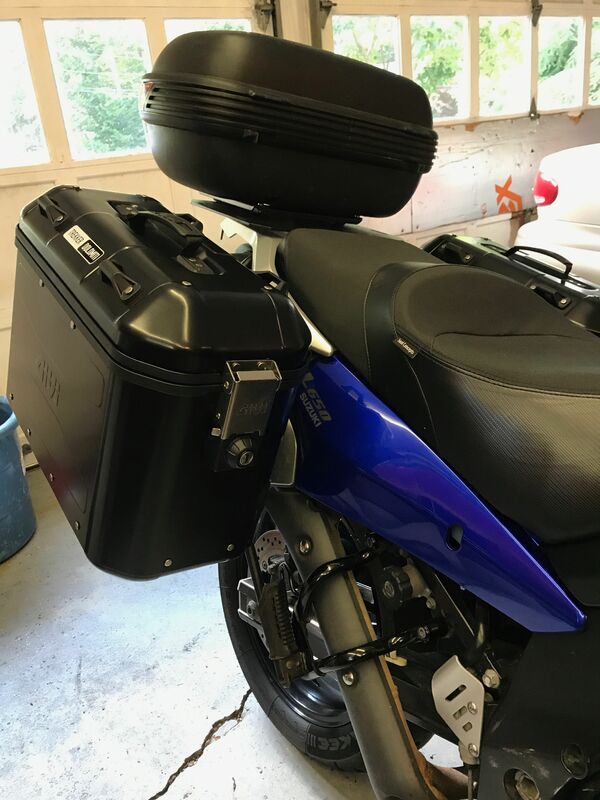 The Givi Dolomiti pannier lids open towards the top box and on my Strom the lids would hit the top box and the not fully open to where it wouldn't stay open on its own. This was annoying. I think on the X it'll be the same story, as the Givi racks are pretty close to the bike and therefore I'll probably run into the same issue with them mounted to my X. They're in the USA right now. I need to go get them this summer. In the end, I would probably want to see the bags in person though. These kinds of things you don't really know about until you have them in hand and can feel the difference. Pics of my Dolomitis for reference.